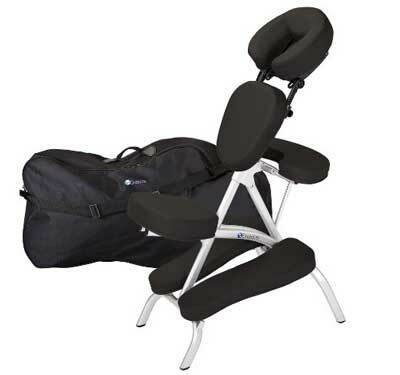 Many massage therapists need portable chairs that will properly support their clients and be easy to transport from appointment to appointment. 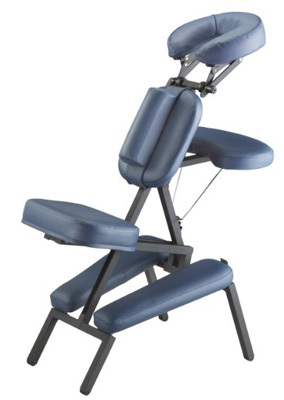 Spas and tattoo salons need reliable chairs to accommodate a wide variety of clients. Some have limited space or accept appointments on specified days or times of the week, so having a chair that folds away or can be moved from place to place within the spa is helpful. There are many reputable manufacturers that sell well made chairs that are comfortable and sturdy. Most have similar specifications. Some are much better built than others. For this reason, there are many different prices for these items, which reflect the differences in frame materials and padded rest construction or adjustable features. Additional options include choices of color and durability and construction of the chair and its carrying bag. Professionals and home users alike will need to consider which features they need at the price point they are willing to pay. 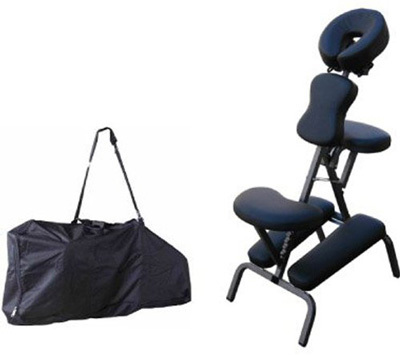 This sturdy, yet basic black massage chair is standard equipment for the traveling therapist. It has a working weight for up to 300 pounds. It has an adjustable face cradle and its rests are made with thick 3 and a half inch foam. There’s nothing spectacular about this chair, but it is lightweight, will fold and fit in the back seat of a sedan or similar sized car. 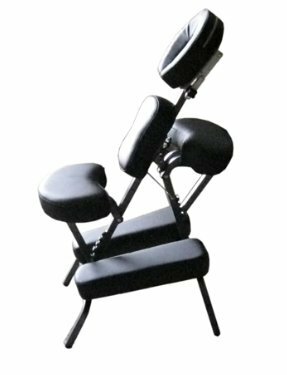 Not a chair, but a transportable massage system, this product has all the rests, pads and support needed to provide a good massage. The difference is that it can be set up in a variety of spots. You can use it on a desk, a table top or in a wheelchair. The combinations are as unique and different as the needs of individual clients. It has beautiful Mystic Blue colored upholstery. The genius of this product is that you can use the various components in different configurations and for different purposes. 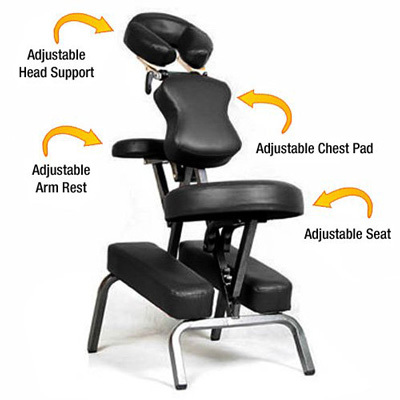 This black, compact massage chair has polyurethane material covering its adjustable neck and arm rests, and its seat. It has a sternum protector on the frame for client comfort. It comes with a carrying case. Purchased by professionals, it has mixed reviews because the adjustable pads do not have enough variation to accommodate all needs. 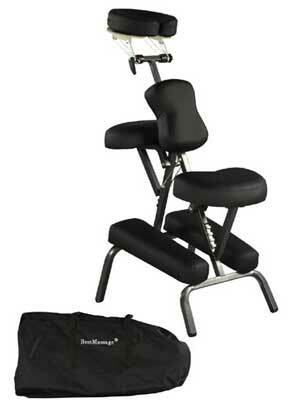 Some felt it should be used by students or beginners in the massage and tattoo fields. Some felt the construction was of poor quality, or had problems requiring parts to be replaced. In one instance, the company sent a brand new chair rather than just replacement parts. The upholstery on this chair is 100% soft black polyurethane material. It is easy to clean and comfortable for clients. 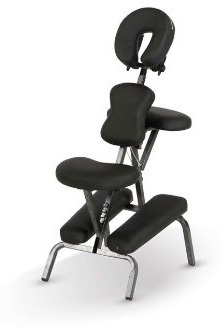 It has a reasonable set up size for a massage or tattoo spa chair. Most owners purchased it for part time use at their salons or spas and felt it was a good purchase for the price. Some had problems assembling it. Everything that can possible adjusts on this chair in terms of padding. That includes arms, head, chest and seat. The frame is made of steel, yet it is lightweight for carrying. The carrying case also has a strap included. This product has received mixed reviews from owners, regarding its quality and problems with parts breaking or arriving broken after purchase. With a working weight up to 300 pounds, and soft blue polyurethane upholstery on the adjustable pads, this is a very nice option. It is compact and comes with its own carrying case. 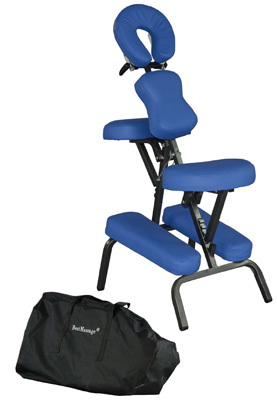 Its compact set-up size and head and hand rests provide client comfort in a tattoo or basic massage spa setting. This blue chair features a sturdy aluminum frame that will support up to 1,000 pounds. 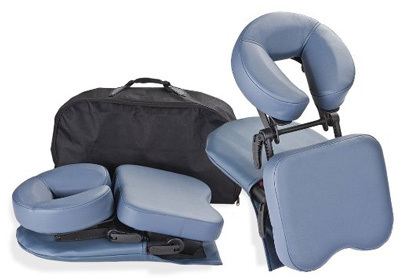 Its pads are high density foam covered with water and oil proof polyurethane upholstery and denim backing. Its face cradle adjusts six ways, and there is a session pouch which will hold glasses or jewelry belonging to clients. The carrying case is in a wheeled suitcase style design. This excellent chair is built with aluminum used for aircraft, making its oval tube construction very sturdy in design. It will hold up to 300 pounds of working weight. It comes with a very nice sternum pad to protect clients and a carrying case. There is a 2 year warranty on its pads, plus a lifetime one for its construction. It is available in 7 different chair pad colors including Black, Hunter Green, Amethyst, Burgundy, Marie’s Beige, Mystic Blue and Teal. This black chair will accept up to 250 pounds working weight. It is constructed with extra wide and thick foam to create a comfort for clients. It has its own free carrying case and its light 18 and a half pounds of weight make it very easy to move and transport. Several therapists were concerned about the arm rests not attaching properly without some extra work and the chest pad is not designed to be adjustable, which can potentially cause some problems with clients. Several students used this product for their school training sessions.